Back in 1996, I spotted a paperback book on a rack near the drugstore checkout counter. The cover was a delicious, milky cream, with a color-tinted polaroid on the cover, and the most dazzling blue foil around the edges. I couldn't stop looking at the blue foil. One glance at the back cover copy told me all I needed to know about the story. It was a sappy romance, and that meant that I would not like this book. So I put it back, bought my basket-full of stuff, and went home. And thought about the book with the beautiful blue foil. Any surprise that I later went back after it? Or that I did not like the story? But that hardly mattered; I'm a sucker for a pretty face. 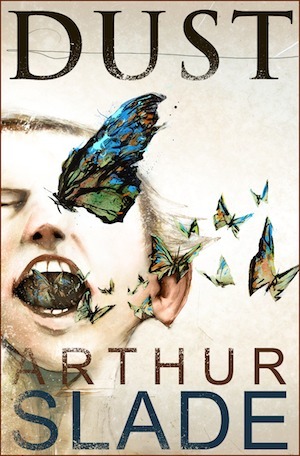 I bought Dust by Arthur Slade, in part because of its cover, the haunting image of a child exhaling butterflies. The story was everything that child made me hope it would be. 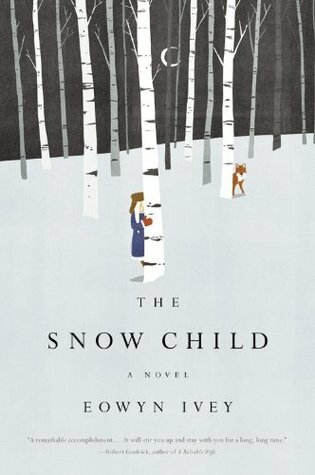 because of the child hiding behind the aspen in the snow. Another beautiful story. portrait of the author herself that graces its cover. dancer on my own To Dance In the Desert. And of course, the covers for Sharon's novels, three of which I was honored to design myself. And Susie Finkbeiner's Paint Chips, with its rose petals and aqua blue. On my to-read-one-day list are several that called me from across the room with beautiful colors, striking images. Among them are Makeda by Randall Robinson, and of course - get ready for the blue - Indigo by Catherine McKinley. What book covers have called to you? Please provide links so we can see them ourselves. We love to see what you like to read. Hehehe! Your story reminded me so much of me when I was about eight or nine...old enough to go to the shop by myself, old enough to earn pocket money, not quite old enough to understand the finer subtleties of how covers can convey genre. I took my hard-earned pocket money and chose my mum a book for Mother's Day. She loved to read, so I chose a good thick one - value for money. And it had the name of the author in big letters on the front - really shiny ones. Those shiny letters were what sold me, truly. They were red. But do you remember the original cover of Virginia Andews' Flowers in the Attic? It was awesome...had a cover with a picture and a little window hole, and then you opened it up and saw the rest of the picture underneath. Lift-the-flap books for grown-ups! (shut up. I was twelve). Although, to answer your question, the first book I bought for myself, as an adult, because I simply had to own the cover, was Robert Drewe's The Drowner. http://www.middlemiss.org/lit/authors/drewer/drowner.html The picture of the cover here really doesn't do it justice, and it doesn't show those gorgeous, lush rough-cut thick pages. Just scrumptious! I won't tell you exactly what I thought of the book, and I possibly won't read it again...but I'll never get rid of it just the same. Read that one twice. Still love the cover almost more than the book. Oh, Katy. Thank you. Thank you. Roseanna White did a gorgeous job on the cover of Paint Chips. It's far more than I'd ever dreamed! Just about 4 years ago, I browsed the fiction section of a CBA bookstore. I found a cover with rich, red hues and a woman in an emerald dress. Just her body. Not her face. I imagined a circus or a side-show. I HAD to have that book. It was by Lisa Samson and called "Embrace Me". I hadn't read Christian fiction in years, despairing that it was all to "safe" and "clean". But that book cover demanded to be bought. I'm so glad I did. When working at the library, I was forever bringing home books with promising covers. I didn't finish all of them. One had a bubble on the cover (can't remember the name) that I dove into and was greatly disappointed. I hope to have a book cover someday with an iridescent bubble that will justice to it's buoyant beauty. My favorite cover of late, and regular readers will NOT be surprised is The Language of Flowers. The one where the girl is wearing a yellow tulle skirt with Wellingtons. Love it. So, it sounds here like you are going against convention and encouraging us to judge a book by its cover? I might, I just might be guilty of doing that sometimes. But many of my books are rescue books - from the thrift store or yard sales. Several others are loaners. They don't always come to me in the best of condition. I even like books with the traditional library bind of dark cloth and contrasting spine tape. What does grab me, though, is a great title. Sometime back on an author blog (It might have been Susan Meisner's), I saw a cover for a newly released book (possibly Kate Morton's). The US version did not grab me; but I really wanted to read the Australian version - purely from the cover. I have a question though. It might get me into trouble, but I'll ask it anyway. Down here you can often tell immediately by looking at a book whether it's Christian fiction or not. There's a Christian "look", and for a lot of people down here it's associated with (oh man, am I really saying this???) second-rate. There's probably a lot of reasons for this, and most of them are cultural differences rather than truly bad books (they sell to the US market in droves, apparently). The reason I think it's obvious to me is that Australian publishers DO use different covers for books (I learned this via Amazon). Possibly because the target audience is different. BUT, when it comes to Christian novels they just import them directly from the US, and there's an obviously different look. But I've often wondered: do Americans look at covers of books and think "Oh yeah, that's a Christian one", or do they actually fit in with other things on the market? Sorry to have taken so long to answer your wonderful comments. I've been traveling, and just this evening got to hold my new grandson for the first time. Susie, we are so proud of you, and pleased that your beautiful book was born at least concurrent with your visits here. Megan, The Drowner's cover makes me want to read it too. Same with Art Objects. Patti, The Language of Flowers looks like a wonderful book. Giggling over the Amish girl covers... And if a real Amish/Plain girl wrote a book, she'd probably say, "Give me anything but one of those bonnets!" Does anyone else remember those $.99 classics at Wal-mart? Yeah, those with the garish, dramatic covers? I think I bought them all and thought they were it. I've been known to rip the cover off a paperback if it didn't fit the story. I especially recall a rather lovely historical that looked like a bodice-ripper. Couldn't have that. Megan said it pretty well. Hi, I've been reading Novel Matters for awhile, but this is the first time I've posted, partly because I've read the Indigo book and loved it. I chose it for the cover as well as for research purposes. One of my most recent books that I picked up because of the cover was River Road by Suzanne Johnson. I'm always on the look for a good fantasy, and this one just caught my attention - a wizard in New Orleans? Course, it had to be the second book in the series so I had to go find the first book to read. In regards to the Christian "look" I'd have to agree with the other comments: Amish/Plain or how the image is set up. It's hard to describe, but on the Historical Novel Society, they review books, and I can usually pick out the Christians ones over the non-Christian ones simply from the cover. Sometimes I'm wrong. I'm thankful that you have a variety of books and topics on the website. It's hard writing fiction with a Christian worldview especially when the stories just don't seem to work for Christian fiction. By the way, my first novel Azure Maris (Bridgette ní Brian)has an intriguing cover. If I wasn't the author, I'd at least pick it up from the library to read.